Guns. Man I have so many complicated feelings when I read that word, particularly when it comes to gaming. In a medieval fantasy setting, how does one create firearms that don’t do what firearms did in our real world – make other weapons obsolete. And then this guy blows up in your face! Explosive I’ve seen a lot of firearms for systems with the caveat of roll a 1 when attacking with this weapon and it explodes dealing the wielder x amount of damage. That’s an interesting drawback! Makes using a firearm risky. However in order for this risk to be fun it needs to have the threat of actually happening. 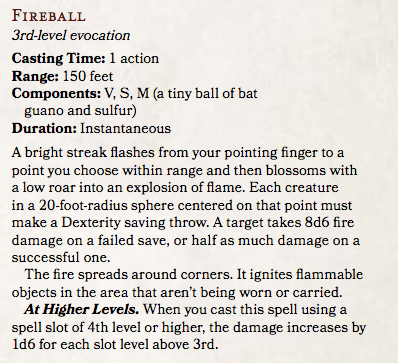 Rolling a 1 on a twenty-sided die occurs 5% of the time, which seems like a good amount of minimal risk, but at the same time I can’t think of ANYTHING that lasts long on the market that also has a 5% chance of fiery-explosion-in-your-faceville. Who would buy that?!?! And even worse, if you survive the malfunction, you have to go buy another one that has the same risk? Cutting those odds down would have to involve a trigger that then sets some more rolls into motion and that would then slow down play at the table. I’ve got to pass on this drawback for Exploration Age’s firearms. Reload Times Well when you consider the real world this actually makes a ton of sense. Primitive guns took quite a while to reload. If you don’t believe me go watch some Revolutionary War reenactments. However, at the table this goes down one of two ways. One, you have one player who took the right feats, ability score increases, and sacrifices to be a great gun fighter who is at best useless every other round. This can severely hamper that person’s fun. Two, all your players carry a gun and use it as an encounter power and then drop the firearm and use other weapons. Either way, I think it’s still missing the mark for someone who wants to create a firearms using character. No Magic This may actually be the worst drawback that is often involved when firearms make an appearance in a fantasy setting. 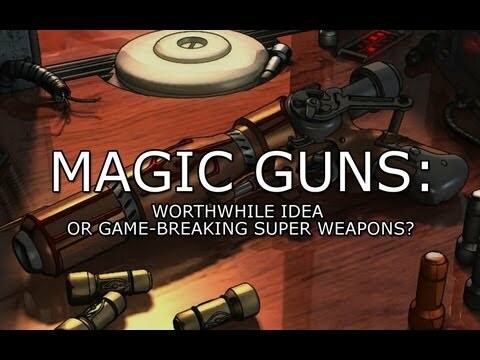 They cannot be enchanted, because, ya know, in a world of squid-headed brain-eaters with mind powers and githyanki knights from the astral plane riding red dragons the thing that doesn’t make sense is a magic gun. That aside, this means most folks aren’t going to carry firearms around for the second half or more of their adventuring career. Regular gun or magic bow that increases you attack and damage bonuses while also possibly granting you a cool special ability and has a sweet name like Oathkeeper or Heartseeker? Not to mention, many high level creatures have damage resistances and immunities that cannot be pierced without a magic weapon, meaning bringing a gun to a dragon fight is a terrible idea. This drawback doesn’t make guns even with regular medieval weapons, it makes them the worst weapons around. Expense This is usually a drawback added to one or more of the drawbacks above in a fantasy setting when firearms get involved. This does make some sense to me, the technology is newer and the weapons are more complex and require more sophistication in their design. Still it seems like an unfair way to punish someone for their character concept, especially if they’re buying a new weapon all the time because their gun just exploded. Plus when you really think about it many guns today are probably cheaper than swords, so I’m going to say that firearms have actually been around for a while and that accounts for their price being on par with other weapons. Feat Tax In many settings a feat is required to use a firearm. This doesn’t make much sense to me since one of firearms advantages is that they are easier to use than most bows. Also, this prevents a character from using firearms until at least fourth level which means you can’t start out as a gunslinger. Going to have to say no. 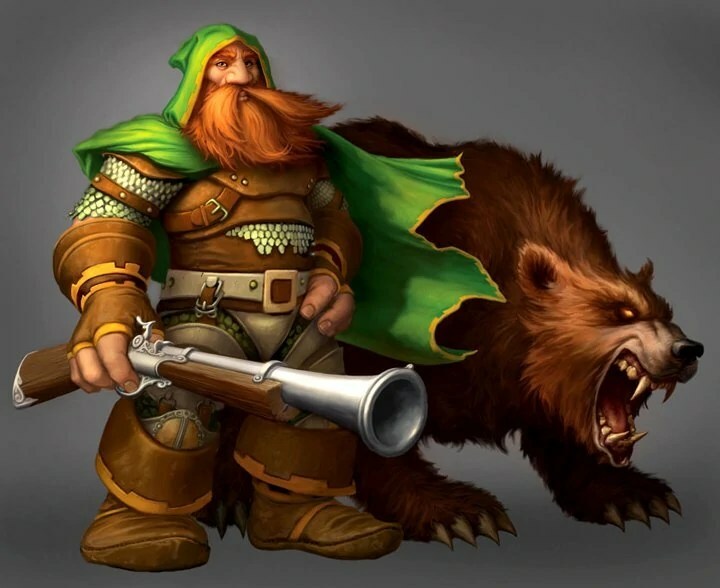 A pet bear AND a gun? That’s cheating. Why do we usually go through adding drawbacks to firearms in fantasy settings? Well, they often deal a lot more damage than other weapons, which, again, at first blush makes sense. Ok, but, now let’s really think about it. In D&D hit points aren’t meant to simply represent the number of times a character can be stabbed with a sword or shot with an arrow before he or she kicks it. It’s a combination of that, plus stamina. So not every hit your character takes is a physical hit so to say. You’re being worn down for that final killing blow. I’m not sure why dodging a sword swing or crossbow bolt would waste anymore stamina than dodging a bullet. Maybe some of you don’t agree with that Wizards of the Coast approved interpretation of hit points. In that case consider the following – if a PC could take say four or five sword hits or arrows without going down, why couldn’t he or she take four or five bullets? Let’s face it in the hands of a trained warrior a sword, bow, spear, trident, axe, hammer, or whatever is just as deadly as a gun. Likewise those not proficient with a sword or bow are just as likely to injure themselves or an unintended target as those not proficient with firearms. 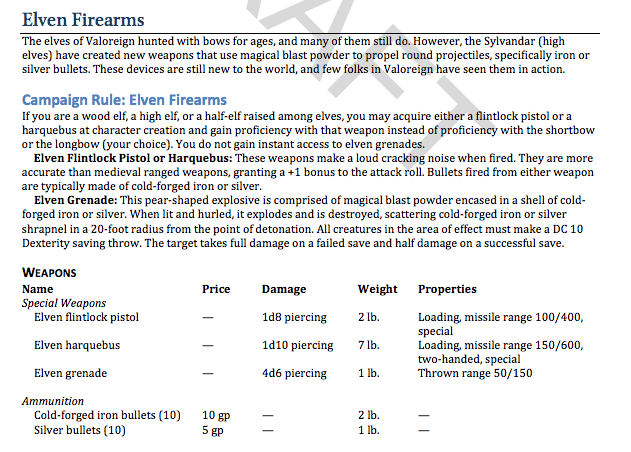 Therefore I believe it is totally plausible that firearms in a D&D game would deal damage on par with other weapons. Maybe just a bit higher? If that’s the case then firearms don’t really need a drawback. Which brings me to another point, I don’t think PCs who want their characters to use firearms are looking to deal more damage in the game. I believe they have a character concept involving firearms they think would be fun to play. They aren’t trying to break the game, just play an interesting character who uses a different kind of weapon. So how about guns in Exploration Age, huh? Well, take a look at these charts and weapon descriptions I’ve been working on below and allow me to explain my thinking. There are two types of firearms in Exploration Age. Those powered by gunpowder and those powered by aberrant magic. Take a look at the descriptions and table below to see what kinds of firearms you could have in your game. Aberrant Revolver Using technology discovered in the aberrant ruins, researchers at The Arcane College created a weapon capable of carrying eight pieces of ammunition. The gun can only take alchemical charges and depending on the ammunition it can deal fire, lightning, cold, or acid damage. Once an aberrant revolver has been fired eight times it needs to be reloaded using an action. An action may also be used to change out the type of ammunition in the aberrant revolver. Aberrant Rifle Like the aberrant revolver, the aberrant rifle was also created by The Arcane College. 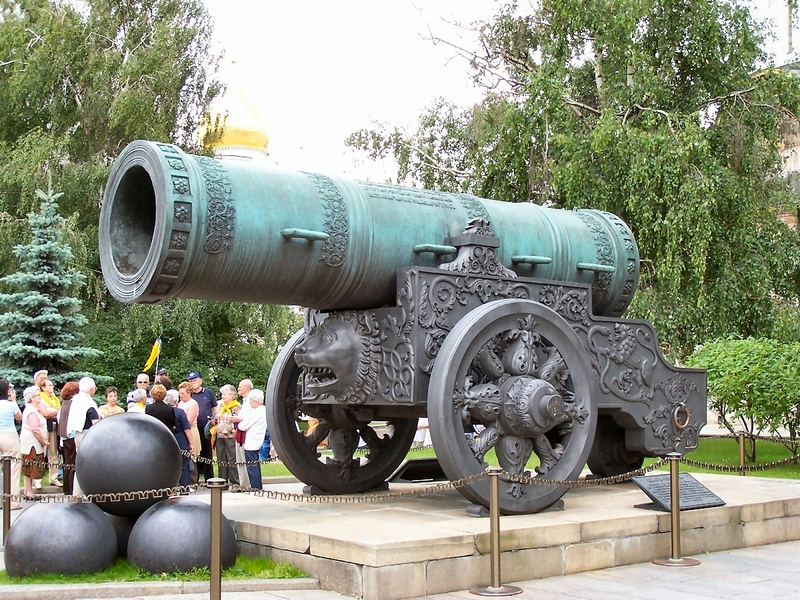 This weapon packs more of a punch and can shoot further distances, though it is bulkier and requires two hands to use. The gun can only take elemental charges and depending on the ammunition it can deal fire, lightning, cold, or acid damage. Once an aberrant rifle has been fired eight times it needs to be reloaded using an action. An action may also be used to change out the type of ammunition in the aberrant rifle. Blunderbuss The blunderbuss is a firearm designed for close combat. Instead of bullets, a handful of pellets may be loaded into the gun. When pellets are loaded, the blunderbuss does not attack normally. Instead all creatures in a 15 foot cone must make a successful DC 14 dexterity saving throw or take 1d4 piercing damage. Ammunition All firearms require ammunition to use. All bullets come with the appropriate amount of gunpowder needed to propel them from their weapons. The arquebus, blunderbuss, and pistol use bullets, the blunderbuss can use pellets, and the aberrant revolver and rifle take alchemical charges. So you can see, the arquebus, blunderbuss, and pistol are all primitive guns. They have the loading property, which means they can only be fired once per round, but do not take a full action to reload. The arquebus does more damage than a heavy crossbow, but sacrifices significant range to do, which feels realistic and not too overpowered nor like too much of a drawback. The pistol is the same deal when compared to the hand crossbow. The crossbow information from the last D&D Next public playtest packet. The blunderbuss is a special case as per it’s description. It has a very small range, but can be loaded with pellets, giving it a shotgun feel. This allows for a little more variety and another kind of feel a player wanting to play a gun-wielding PC might be after, though it is not overpowered since the spread option does only a little damage. The aberrant guns take a different approach to firearms. This is a bit more sci-fi. I know, I know, don’t put your lasers in my fantasy, but hear me out! Exploration Age is already a world of airships, living constructs, and other strange magic technology. I think it makes sense that a world with a history so full of wars would have invested in a few weapons, especially with all this aberrant technology lying around, waiting to be discovered. When it comes to distance and damage, you can see the aberrant revolver and rifle are just like the shortbow and longbow presented in the last public playtest packet for D&D Next. There are a few big differences when you look at descriptions of these items. The guns take an action to reload every 8 shots, that’s their disadvantage. Their big advantage is that they can do variable elemental damage types based on the ammunition with which they are loaded. Shortbow and longbow stats from the last D&D Next public playtest packet. Also, take a look at the supplemental rule I’m adding to Exploration Age which allows the use of two light ranges weapons at once, so a character can use two pistols or two aberrant revolvers and have more a gunslinger feel during play if that’s what a player is after. Ranged Two-Weapon Fighting When you are fighting with two light ranged weapons, you can attack twice when you take the attack option on your turn, attacking once with each weapon. You don’t add your ability modifier to the damage of the second attack, however. If you haven’t used your full move for the turn, you can move between attacks. And if you are wielding a light melee weapon in one hand instead of a light ranged weapon, your attack with that weapon is a melee attack. This is based on the last public playtest packet’s melee two-weapon fighting rule. 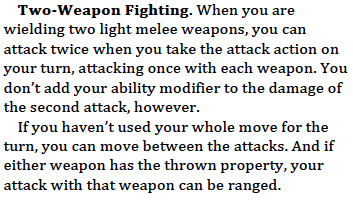 The two-weapon fighting rules from the last D&D Next public playtest packet. So, how’d I do? Does this make sense or the guns too absurd in some way? Too little damage? Too much? Not enough drawbacks? Too many? I really want to know what you think!